Not really. The crew put that aircraft into a stall after they failed to apply basic aeronautical techniques for stall recovery. Big difference between that and an aircraft pitching uncontrollably nose down at low altitudes. A aircraft with uncommanded trim does not pitch uncontrollably nose down. As the trim motor adds nose down trim up elevator can compensate until the stabilizer overpowers the elevator. At that point the nose will start down. Normally it’s a smooth progression unless the aircraft is on autopilot. The autopilot disengaging with a out of trim condition will cause a more violent pitching moment. Prior to that however there should be several warning signs. The fix takes about 1 second to activate and the flight should be able to continue with manual trim. Had it happen on a 727. It was a non issue. Trim ran away nose down, trim disconnected and flight continued. Well, in theory you should design to be safe for the worst crews on their worst days. Even if something is designed to be usable by the "average crew", nearly half of your pilots on a given day will be below the level that you designed for. Any system that you design should be built to the specs of the Minimally Acceptable Candidate: someone who is unfamiliar with the matter (let's say, a pax) does not necessarily need to understand the system. However, those who are trained and licensed to fly should be able to understand the system without much difficulties. If one needs to be an expert on the system itself in order to use it, it is by definition unusable. Similar to the big internet. Everyone reading this uses the internet, but I doubt more than 1% will even remotely know what a BGP community is. And that's fine, because this system was designed for the "average" user. When I passed my Private's checkride, I had a reasonable understanding of the 172 I was flying. Engine, electrical systems, flight controls, instruments; the lot. I even understood the workings of the shimmy dampener (it does help if you fly an aircraft with a broken shimmy for a change). Any airman should be able to understand MCAS, or any other flight system for that matter, even on a bad day. If not, then either the system is too complex and risky to introduce, or the airman should not have received their license and rating(s). This equates to a dangerous aircraft on my matchbox. Anyone else get a different mathematical answer? I am reminded of Concorde, which with one accident went, statistically speaking, from the safest to deadliest airliner then flying. Now is probably a great time to buy Boeing shares. I have rarely seen such utter tripe talked over two accidents that look, at least at first glance, to be caused by sub standard pilots getting caught by the same tricky but surviveable system failure. Read the 3$%^&ing Boeing AD! Another reason to stop putting undertrained muppets in airline pilot seats. P.S To ‘Rananim” a pilot of a large passenger jet will NOT be able to distinguish between a faulty sensor and a “real” stall since the aircraft is not certified to stall at all, it is never intended to be stalled, nor does it provide the physical warnings of an incipient stall. That is the reason for all those stall protection systems! That is also the reason for extensive training on systems and their failure modes. Not certified to stall? Hogwash, we just did full stall recoveries in the sim. Extreme buffet, wingrocking, 6000 plus vvi sinking stalls. This however was not a MAX sim. Has anyone considered the idea that MCAS was activated appropriately and the crew fought through it even though it was trying to “help” them? ie- they were in a nose high, low airspeed condition. I believe in the Colgan Dash-8 crash, the Captain pulled through the shaker and pusher not believing the aircraft had stalled but (speculation) perhaps believed he was in a tailplalne stall. 6000’?? I saw 9999 when I did my EET! Aviation, particularly transport aviation, is a high-performance profession; constant training and knowledge are fundamental for safe operations. Like nuclear engineering or medicine, procedure is king. However, the operator needs sufficient knowledge to understand "What's it doing? Why is it doing it? Do I need to stop it? How do I stop it? What else does stopping it do?". It's a bit sad to see some sentiment that the crew are just trained to watch the computers (see the old pilot and dog in the cockpit joke) and follow the QRH, otherwise they might be overwhelmed. I really doubt it, in most cases. Aviation got to where it is because of these practices, via some extremely tough lessons. Both the FDR and CVR have been found. That might be true but these accidents have sure stoked a lot of legitimate debate about the role of software in flight control. It used to be you had an autopilot and it was either on or off. Now it can be "on" even when it's off if the logic decides the PF requires a "bit of assistance" - leading in some cases to the proverbial "wtf" adverse reactions from the manual input dimension. In the case of MCAS it looks to me to be a victim of the success of the 737's longevity. It's probably the most versatile airframe ever built having survived 50+ years of power-plant evolution, geometrical stretching, role revision and load growth (GTWO has not-far-off doubled I think since the 100). Then along comes the straw that breaks the camel's back - a couple of engines that really required a new airframe design to get properly certified with comfortable aerodynamic margins. But such is the versatility of software these days that any shortfall in aerodynamic completeness can be handily compensated for. So in a competitive environment it inevitably happens. Doesn't mean you can't have lots of software doing useful stuff with a solid aircraft design, it's just that it should'nt be doing the airframe's job IMO to an extent that it's a weak link. Looking at that hole in the ground posted earlier on (if the pic is legit) is positively hair-raising. Although we are speculating (it is a "rumour network after all"), the only times I've seen anything like that is if a wing is shot off or something/one has forcibly pointed the nose at the ground and applied full throttle since aerodynamically stable craft generally always have some horizontal component of velocity regardless of what you do to them. Even Lockerbie had a semblance of a detectable hull left after it fell 30,000+ feet. Not saying there isn't some unrelated cause that's nothing to do with the discussions here. Just saying there is a strong engineering and philosophical case (IMHO) for not doing what Boeing did with the Max and sellotaping over geometrical design deficiencies with software. Last edited by indigopete; 12th Mar 2019 at 09:45.
to be caused by sub standard pilots getting caught by the same tricky but surviveable system failure. Utter drivel. The plane came down on a clear sky, CAVOK day in daylight conditions. From the momentum obvious with two working donks. Even a substandard pilot should not fall in this conditions out of the sky with a brand new plane. We most likely know now with 20/20 hindsight, that the AD was not a sufficient reaction to prevent further fatalities. In service for 2 years, each aircraft available 340 days/yr, 5 sectors/day. Total number of departures: approx 1.2m giving a fatal accident rate of 1.67 per million flights. They were not in a speed low situation. Their speed was steadily increasing. Is there some logic in having a couple of switches operating in the opposite sense to the rest ?? A aircraft with uncommanded trim does not pitch uncontrollably nose down. As the trim motor adds nose down trim up elevator can compensate until the stabilizer overpowers the elevator. At that point the nose will start down. Normally it’s a smooth progression unless the aircraft is on autopilot. Says someone who has never flown the 737. It was a deliberate ploy by Boeing, to confuse everyone. A bit like placing the fire handles (and fire warning lamps) out of your field of vision - to confuse you even more. Last edited by silverstrata; 11th Mar 2019 at 17:09. Yes. The scheme is, on any vertical surface (like the instrument panel, or a wall) up = on, same as any switch in the rest of the world. On any horizontal surface (center pedestal, or overhead) forward = on. For the center pedestal, the forward = on scheme elegantly matches what you're used to (toward the top of your eyeball = on). But I've always thought that that's a stupid application on the overhead, which gives the feeling of upside down switches since it reverses the "toward the top/bottom of your eyeball" relationship, and instead it should just be treated like a wall. And the 737 seems to have very few switches in places that aren't the overhead, so the overhead upside-down scheme prevails. But the stab cut out switches are on a place where the normal (up = on) scheme is in place. @ Indigo A mod too far? For those wondering why MCAS is being discussed. A brief look. As discussed on another forum and its references, the MCAS was implemented to cope with some aerodynamic "characteristics", as the name suggers:" Maneuvering Charteristics Augmentation System" As others have pointed out, the new engines and their mounting can provide nose up forces at higher than normal AoA. So looks to this old pilot, who has lottsa high AoA experience, the MCAS was supposed to make it harder to command more nose up. I include a small diagram of pitch coefficient for one plane I flew. 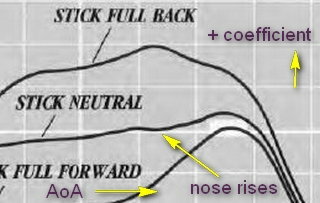 At one AoA and higher, the plane "digs in" with neutral controls, and further, it "pitches up" even with forward stick. So it is not surprising Boeing would add something to "help" keep the nose down and not enter that arena where even nose down commands would not be enough. A poster has commented that the 737 stall has plenty of warning, and I doubt it has that one area where nose down stick won't help. Nevertheless, the MCAS looks like it will make it hard to get there. We saw over 100 pounds of back force for JT610 once the trim was way nose down. This afternoon German press Spiegel say TUI HQ is now considering the grounding of its Boeing 737 Max 8 aircraft . "We are in close contact with Boeing and will evaluate soon the situation with the manufacturer," said Tuifly spokesman Aage Dünhaupt. But TUI UK are not saying much. The fleet of the world's largest travel group Tui now includes 15 jets of this type, which are stationed in the United Kingdom and the Benelux countries. You cannot be busy with ANYTHING else. Not with unreliable airspeed. AVIATE, NAVIGATE, COMMUNICATE. I have lost count the number of times that I had to ask the PF to fly the aircraft and I will do any thing required heads down. while at low level. Even in the sim with abnormals people just get sucked into the MCDU while PF. Unreliable airspeed means the PF has to set 80% n1 and fly 10 degrees pitch, that is his only job. If the trim is running against you it should be quite obvious right away as it will be harder and harder to fly 10 degrees pitch. If you are trying to do something else at the same time by the time you look at the pitch again it might be too late.